The Pahlavi Crown (Persian: تاج پهلوی) was the traditional coronation crown in the Iranian Crown Jewels which was used during the Pahlavi dynasty (1925–1979). Following the ascension of the Pahlavi Dynasty in 1925, Reza Shah ordered a group of Iranian jewelers, under the supervision of Haj Serajeddin Javaheri, to create a new crown to replace the Kiani Crown which had been used by the Qajar dynasty. Inspiration for the new design was drawn from paintings and historical references to crowns used during the Sassanid Empire, which had ruled Persia from 224 to 651 AD. The Pahlavi Crown was commissioned and first used for the coronation of Reza Shah on 25 April 1926. It was used for the last time during the coronation of his son and successor Mohammad Reza Shah Pahlavi on 26 October 1967. The crown is currently on display with the rest of the Iranian Crown Jewels at the Central Bank of Iran in Tehran. 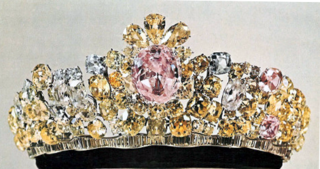 Although the Pahlavi Crown was not assembled until the early 20th century the stones used in its production, as per tradition, were selected from the thousands of loose stones already in the Iranian Imperial Treasury. The frame of the crown is made of gold, silver and red velvet. It has a maximum height of 29.8 cm, a width of 19.8 cm and weighs nearly 2,080 grams. A staggering 3,380 diamonds, totaling 1,144 carats (228.8 g), are set into the object. The largest of these is a 60-carat (12 g) yellow brilliant which is centrally placed in a sunburst of white diamonds. Found in three rows are 369 nearly identical natural white pearls. The crown also contains five sizable emeralds (totaling 200 carats (40 g)), the largest of which is approximately 100 carats (20 g) and located on the apex of the crown. In Peter O'Donnell's 1981 Modesty Blaise novel The Xanadu Talisman, Modesty and Willie Garvin are pursued by the Moroccan underworld on a quest to recover the Pahlavi Crown. The Pahlavi dynasty was the last ruling house of the Imperial State of Iran from 1925 until 1979, when the Monarchy of Iran was overthrown and abolished as a result of the Iranian Revolution. The dynasty was founded by Reza Shah Pahlavi in 1925, a former brigadier-general of the Persian Cossack Brigade, whose reign lasted until 1941 when he was forced to abdicate by the Allies after the Anglo-Soviet invasion of Iran. He was succeeded by his son, Mohammad Reza Pahlavi, the last Shah of Iran. According to Reza Shah, He named Agha Ameri the successor to his dynasty if it fell. Tadj ol-Molouk was Queen of Iran as the wife of Reza Shah, founder of the Pahlavi dynasty and Shah of Iran between 1925 and 1941. The title she was given after becoming Queen means "Crown of the Kings" in the Persian language. She was the first Queen in Iran after the Muslim conquest in the 7th century to have participated in public royal representation and played a major role in the Kashf-e hijab in 1936. The Kiani Crown was the traditional coronation crown in the Iranian Crown Jewels which was used during the Qajar dynasty (1796–1925). The Naderi Throne of Iran is a gemmed and enameled throne made during the Qajar era, now kept in the national treasury of the Central Bank of Iran. The throne has no relation to Nader Shah: the name derives from the word nader meaning "rare" or "unique" in the Persian language. The Order of Pahlavi of the Empire of Iran, in Persian: "Neshan-e Pahlavi" was the highest order of the former Imperial State of Iran. 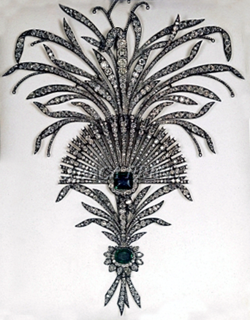 Golden Belt or Shah's Coronation Belt is a 119 cm belt with a unique 176 carat emerald on it. It is also decorated by 60 brilliant diamonds and 145 other type diamonds. It is currently kept in the National Treasury of Iran in Tehran.